Welcome to this introductory episode of the Coffee Break French Verb Fix in which we explain the concepts behind this course and offer an introduction to the whole idea of French verbs: how they work, what it means to conjugate a verb, and the meanings of the four main tenses we’re covering in the course. This show is your weekly fix of Coffee Break French, and through the weekly episodes we’ll help you “fix” your French verbs. We believe that mastering your verbs is the key to developing confidence in written and spoken French. The Verb Fix will help you to learn the conjugations of each verb in the present, perfect, imperfect and future tenses. With the help of repetition, interactive quizzes and even musical backing tracks, you’ll be building your confidence in verbs in no time! 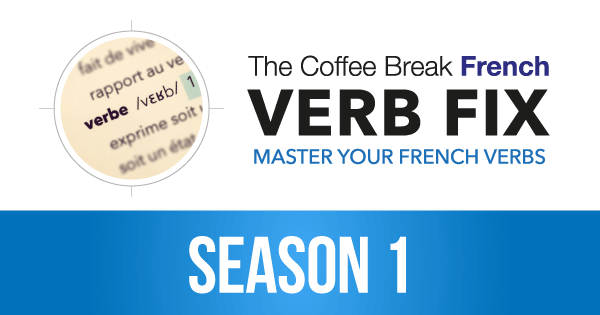 The Verb Fix is supposed to go with a particular Season of Coffee Break French? Or I can listen to it along with CBF Season 1? There’s no reason why you can’t listen to the Verb Fix along with Season 1, but it’s probably better to listen with Season 2 because that’s when we cover more about verbs. Hope that helps.